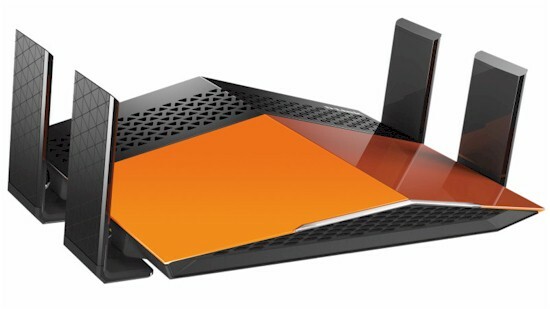 AC1900 class routers have become the product of choice for folks who think spending $300+ on a router is, uh, nuts. This class is well down the price curve at this point, with many models retailing for $100 or less and some even pretty decent performers. So when D-Link introduced its lower-priced EXO routers at CES 2016, you have to wonder what problem they were trying to solve. Product positioning aside, the DIR-879 is styled to remind you of D-Link's much higher-end fire engine red Ultra series introduced at CES 2015. But the EXOs have simpler styling, with four permanently attached antennas that swing out into a fixed position and can't be rotated. Ventilation slots are somewhat sparse, moreso on the bottom than top. There are two mounting screw slots that point the back connector panel toward the floor. You'll need to use long screws when mounting or remove the four tall bottom rubber feet. In keeping with its low-cost theme, there is only one LED on the router front edge that uses color and on / off / blink to indicate all status. The Gigabit Ethernet ports have no link or activity indicators, which I know annoys my colleague Craig. There are no USB ports either, so no storage or printer sharing. Key to the DIR-879's lower cost is its Realtek-based design, which has an little twist. While AC1900 routers usually have three antennas to match their three stream designs, the 879 has four, which are all dual-band. This makes the 879 the only other four-antenna AC1900 class router besides Linksys' Marvell-based WRT1900AC and WRT1900ACS. But the 879's difference is that the fourth antenna comes into play only for receive to improve sensitivity; there are no components loaded on the board to complete the fourth transmit chain. Table 1 compares the 879 with D-Link's Broadcom-based AC1900 class DIR-880L that is its direct competition if you're partial to D-Link routers. The 880L was D-Link's first AC1900 router that came to market rather late, using a first-generation BCM4708A processor. The 879 has D-Link's new admin interface described in detail in the DIR-880L review. There is no on-line emulator. Here's a feature rundown, mostly extracted from browsing through the admin GUI. DHCP server with lease time setting and broadcast controls.